Golf balls at Oban Airport. 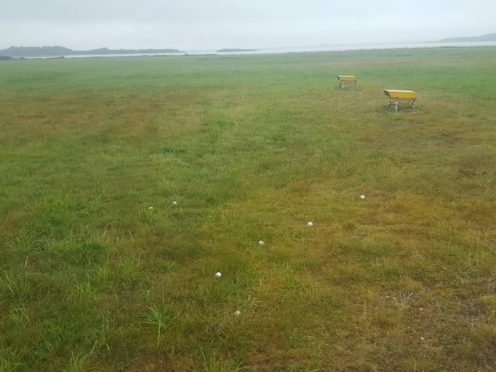 Concerns for the safety of air traffic at Oban Airport have been raised after 40 golf balls were aimed at the runway. Police are investigating the incident after the balls appeared overnight. They are believed to have been either hit or thrown from the neighbouring rugby pitch, which borders the airfield’s perimeter fence. Airport staff discovered the balls when they arrived for work on Sunday morning. Community Police Sergeant Iain MacNicol said: “The golf balls had been thrown or hit with golf clubs since the runway was checked on Saturday evening. “Airport staff and police are very concerned that a golf ball could cause danger to aircraft or damage lights on the runway. A post on the airport Facebook page said the balls seemed to have been aimed at the yellow boxes by the runway called Papi (precision approach path indicator) units. It stated: “During the runway inspection this morning we found 40 golf balls which appear to have been aimed at our PAPI units. These units are a piece of safety critical equipment which if damaged can give pilots the wrong information whilst landing. Less than two weeks ago a small private plane crashed as it attempted to take off at the airport. The three people aboard the aircraft were uninjured after it “had an unsuccessful take off” on Friday July 13 and traveled through gorse bushes onto the shore. A spokesman for the Air Accidents Investigation Branch (AAIB) said: “Regarding the incident on July 13, we are still awaiting further information. A precision approach path indicator (Papi) is a visual aid that provides guidance information to help a pilot acquire and maintain the correct approach to an airport or an aerodrome. It is generally located beside the runway.